Affecting about one in 2,500 children, craniosynostosis is a condition in which the bone plates in a baby’s head fuse too early. Untreated, this can lead to excess pressure in the skull and learning disabilities, in addition to cosmetic deformity. But treatment usually involves open surgery. Dr. Sun offered Parker’s parents two options: high precision endoscopic surgery which is a minimally invasive surgery or traditional surgery that involved opening the whole head from ear to ear. Open surgery is a four-to-six-hour operation with three to four days in intensive care. This procedure would include a long recovery time with a guaranteed blood transfusion. And Parker would also have to wait until he was 6-12 months old. “Dr. Sun thoroughly explained our options,” says Parker’s father, Hardy. “He emphasized that endoscopic surgery needs to be done soon after birth because of possible brain damage and other potential problems. He also encouraged us to speak with the mother of another patient who had endoscopic surgery, which tilted us toward endoscopy.” Also, Children’s Oakland’s team of neurosurgeons has achieved national fame and been ranked among America’s top surgeons by Consumers’ Research Council of America. The team performs between 300 and 350 neurosurgeries each year. And Children’s Oakland is known for its post-operative care in the largest pediatric and neonatal intensive care units in Northern California. 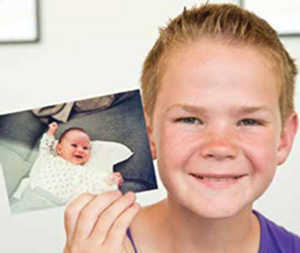 Parker’s endoscopic surgery was performed at the age of 3½ months. All craniofacial surgery at Children's involves both a pediatric neurosurgeon and a plastic surgeon. Dr. Sun working together with Dr. Toth, director of Children’s Craniofacial Center fused suture and strips of bone with an endoscope or lighted retractor through two small incisions. Parker remained in the hospital only for a few days, compared to the much longer hospital stay required after traditional surgery. As well, a multidisciplinary panel of specialists at Children’s was there to coordinate the additional care Parker needed. 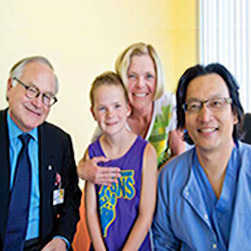 In 2002, Children’s Medical Director of Neurosurgery Peter Sun, MD, became one of the first pediatric neurosurgeons in the country to perform endoscopic craniosynostosis surgery. He studied under neurosurgeon David Jimenez, MD, who, with his wife, plastic surgeon Constance Barone, MD, developed the procedure. Children’s Oakland is the only facility in northern California with extensive and long-standing experience in endoscopic craniosynostosis and skull surgery, and this procedure has not been performed on a regular basis elsewhere in the region. Traditional surgery to correct craniosynostosis requires a long incision across the skull from ear to ear, behind the baby’s hairline. The surgeons remove major portions of the skull and rearrange the bones to achieve a normal skull shape and size. This type of surgery typically is performed when the child is 6 to 12 months old. Endoscopic surgery for craniosynostosis involves making two small incisions and inserting tiny instruments to remove the fused suture and strips of bone. This type of surgery must be performed during the first few months of life before too much brain growth occurs, generally when the baby is about 3 months old. “Endoscopic surgery is the optimal approach for correcting sagittal synostosis, but it must be performed at an early age when the bones are much thinner and easier to cut through,” says Children’s plastic and reconstructive surgeon Bryant Toth, MD, a care team partner in this specialized surgical procedure. According to Dr. Sun, invasive traditional surgery may sometimes require additional revision surgeries. “Minimally invasive surgery produces better cosmetic results, has a shorter hospital stay, offers the possibility of not needing a blood transfusion and there is less chance of having to perform revision surgeries,” he says. “In the 12 years that we have been doing endoscopic craniosynostosis surgeries, we have not had to perform a single revision surgery for sagittal synostosis. It is definitely the procedure of choice in my mind. Early diagnosis is critical and makes this possible"